Even though I don’t believe my structure will turn out as nice as these – especially on the first attempt – I really don’t want to spend over $100 on a kit. Figuring out how to make things from scratch is what makes the hobby fun. I decided to construct the station building first of all. It’s a classic railroad structure and I could easily find prototype pictures drawings to assist me. In particular I wanted to learn how to build a hipped roof with some sort of gable. I also decided to use styrene instead of wood for this little project. In my last module I build the depot structure from wood. Wood was a very satisfying material and I’ll use it again for structures but for this project I really wanted to get better acquainted with styrene. I one of the qualities I wanted was to have sharp edges at small scale which is easier to achieve in styrene than wood. Not knowing where to start I decided to at least get some plans sketched to work from. 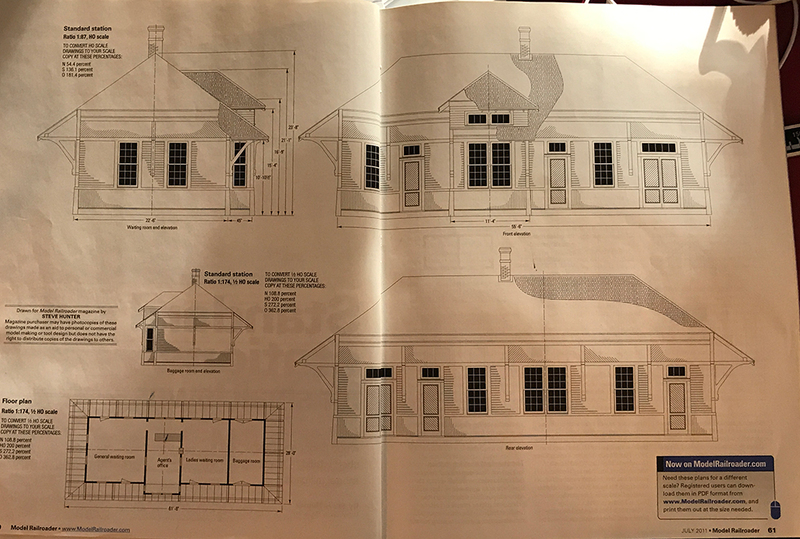 I looked through my back issues of Model Railroader and eventually came across some plans of a station building that looked just about right. 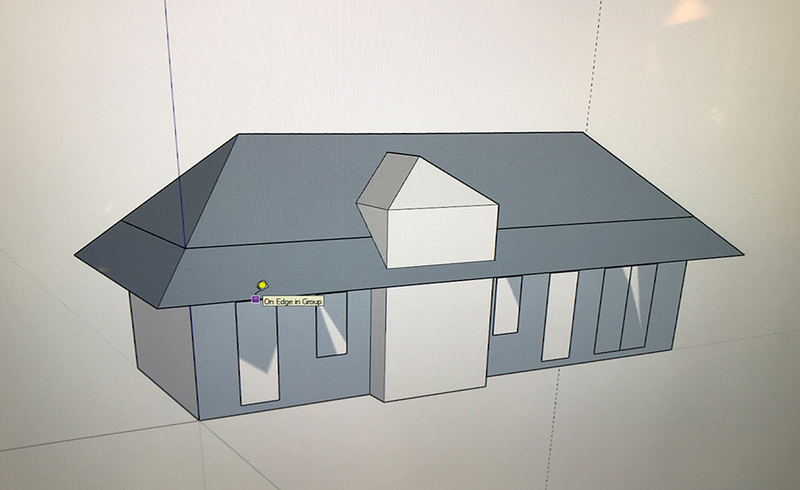 I don’t have the skills to make something exact, but I just wanted to get some dimensions so that I could draw a plan in SketchUp. At some point I will attempt to do an exact copy of this structure but right now I just need the drawing to give me some working dimensions. I transfered some dimensions to SketchUp and created a very simple version of the printed plans. I then built a mock-up from these plans in cardboard so that I could figure out how to put the roof together. Roofs are easy to draw in SketchUp but the real value is that it will then give you the exact measurements and angles of the various roof components saving me having to get my calculator out and try to remember my trigonometry! Yes this is very crude but I wanted to figure out how to do the gable. I can see that getting the angled pieces to fit together is going to be the biggest challenge. 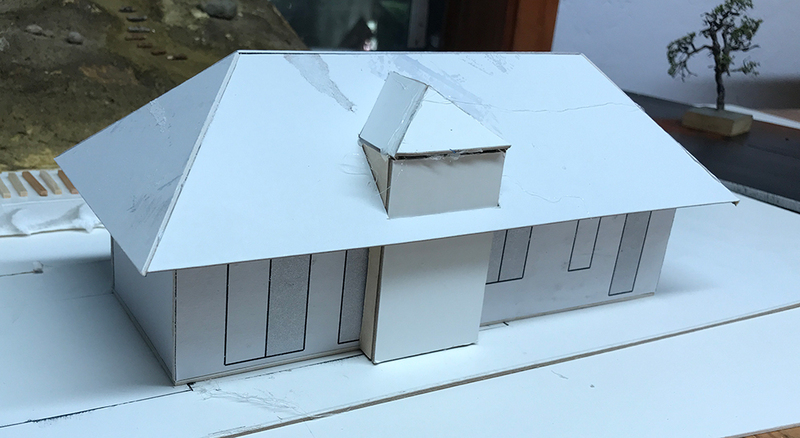 I was also able to figure out that the gable roof section should be a separate section from the base and should sit on the roof (and not go through it). I just found out that Grandt Line – (https://www.grandtline.com/) my ‘go to’ source of windows and doors – has gone out of business. Apparently there are new owners but they have yet to respond to my various emails. As such I had to make do with the random doors and windows I have left over from the grab bags that I own. Not ideal but for the sake of keeping some momentum on the project enough to keep moving. 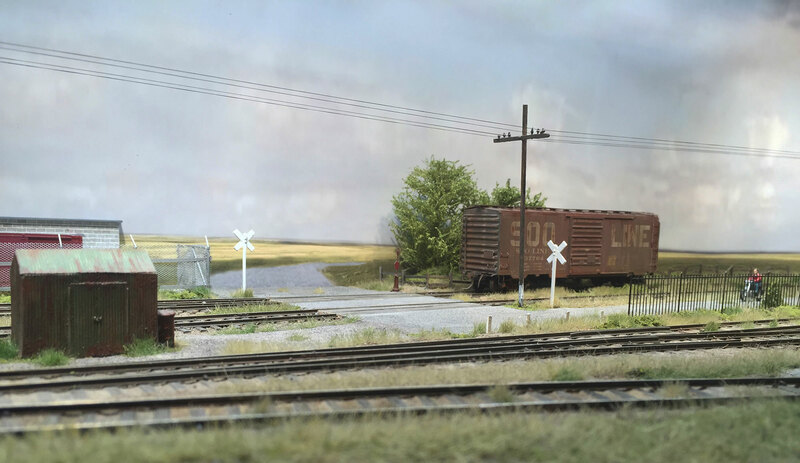 I just found out that Tichy Train Group has what I need so I’ll get an order in at some point and get the exact doors and windows I need to get the station as close to the drawing as possible. 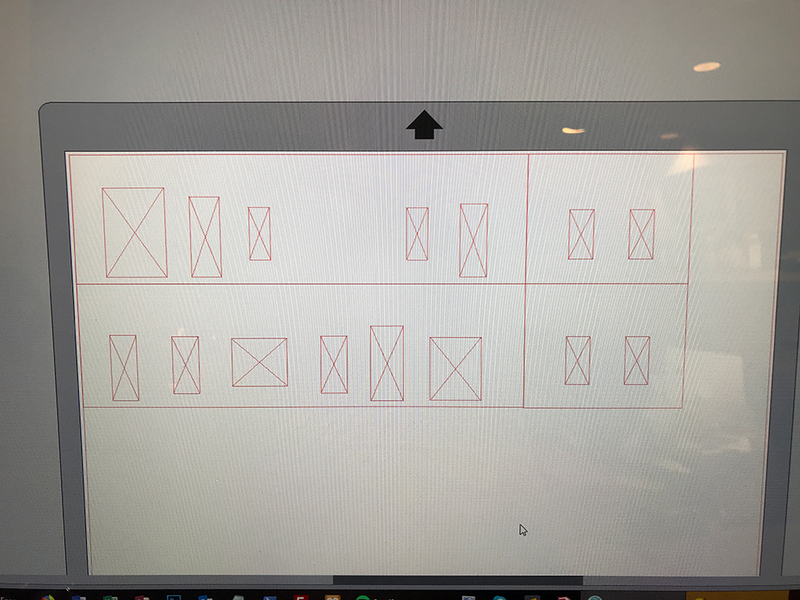 Instead of adding the dimensions to SketchUp I decided go straight to my Cameo Silhouette and start designing the walls/faces with the openings for windows and doors. It’s been two years since I last used this machine and it took a short while to remember out how to use it. 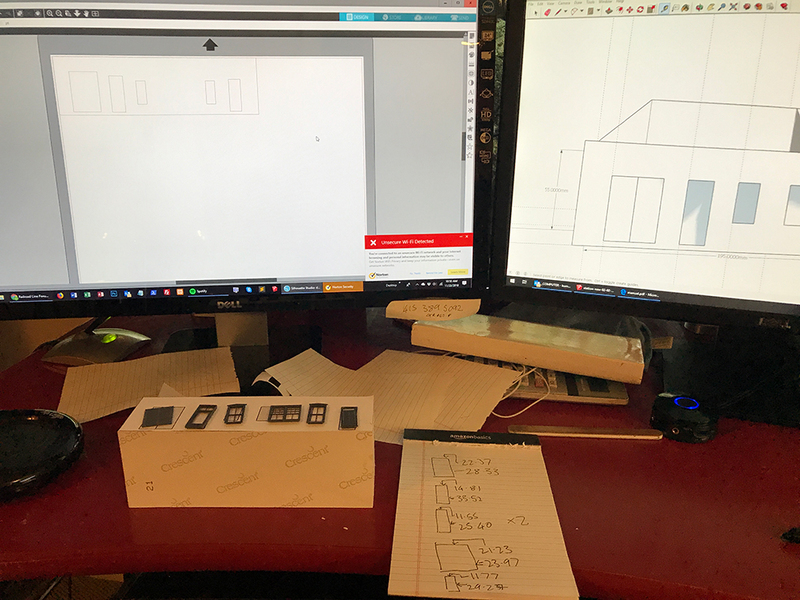 I transferred the SketchUp dimensions to the Cameo software and then used my calipers to measure the window and doors openings. I marked out the openings and added crosses to them to help me punch them out. 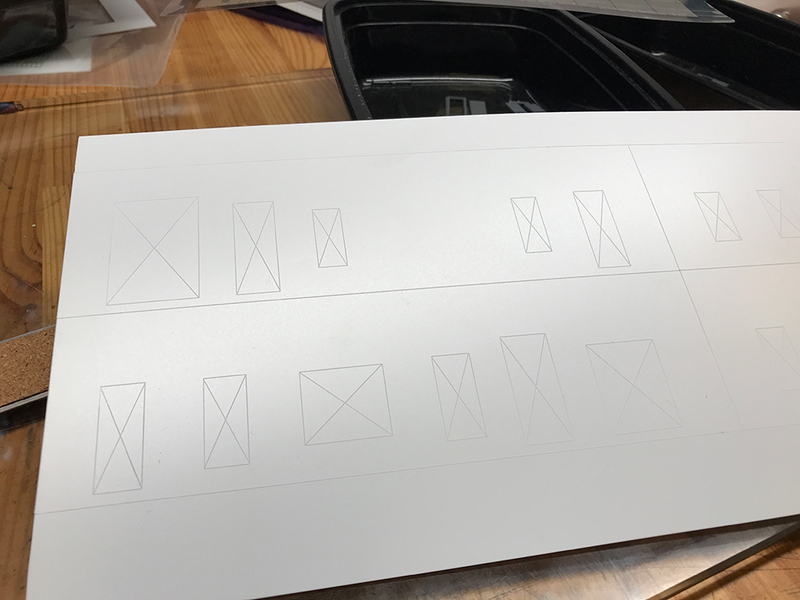 Then once I had the four walls and openings marked out I did a test cut with paper to catch any errors – I found several and made adjustments. Then, using .75mm styrene sheet I let the Cameo do its work scribing the plastic fast and accurately. 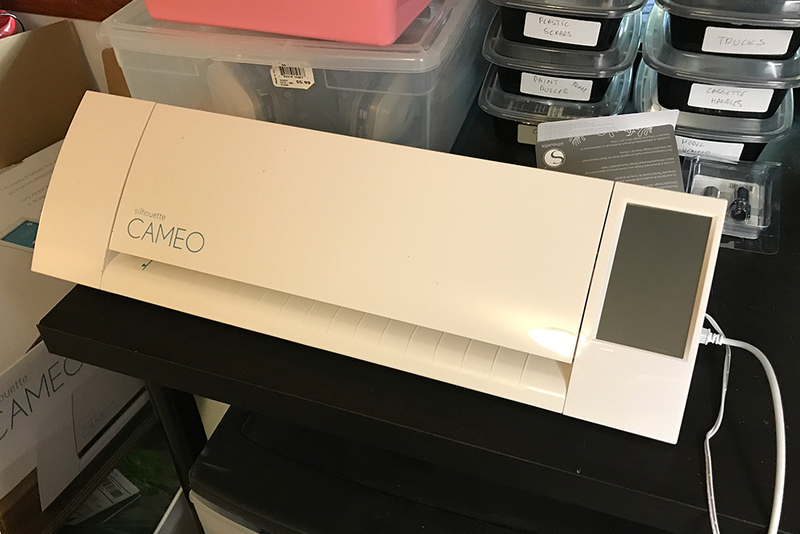 The Cameo Silhouette doesn’t cut styrene – it scribes it deep enough for you to snap out the shapes. But snapping out the styrene is very easy, is very accurate and needs minimal filing down to clear any ridges or unwanted plastic. Some of the snapping out needs care especially where the remaining pieces are small. For the windows and doors I deep-scribed by hand the X-marks in the openings so that X’s were basically cut free leaving just the square edge. 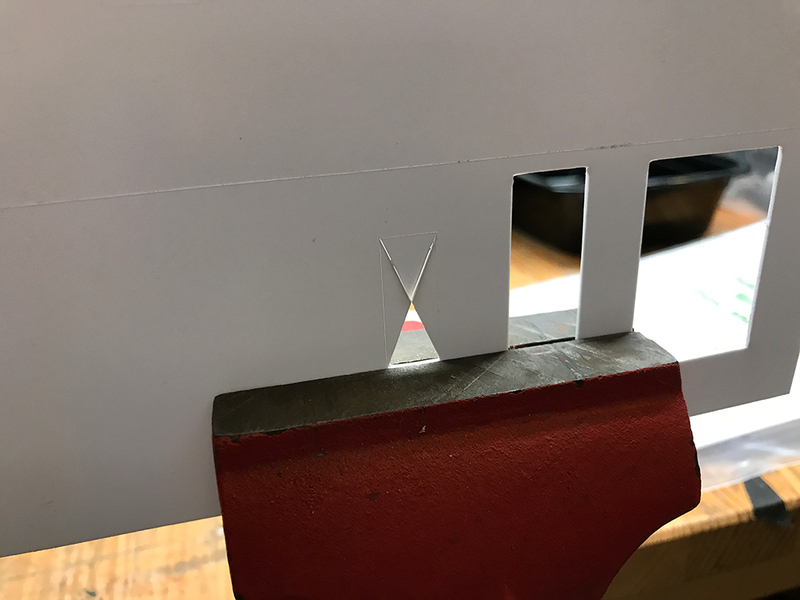 I put the styrene into the vice and lined up the vice mouth with the scribe mark and just pushed the piece back and forth till it broke free – very easy and resulting in a very clean cut. The openings are better than anything I could have done by hand. Then after some cleaning up of both the walls and the windows and doors I fitted them. All looks good. I made small errors here and there but all in all it came together nicely. 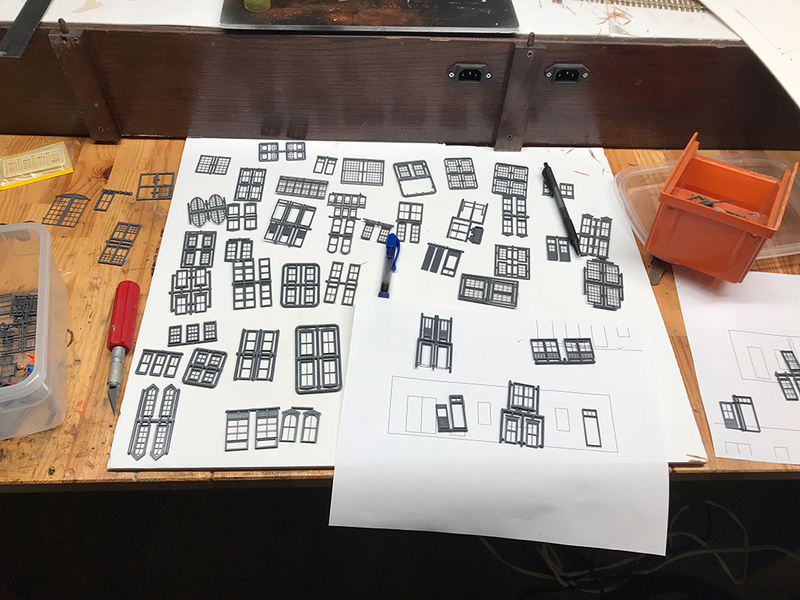 Since writing this post I was pointed (by other modellers on this forum) to the Tichy Train Group where I was able to find windows and doors that exactly matched the plans that I was working from. 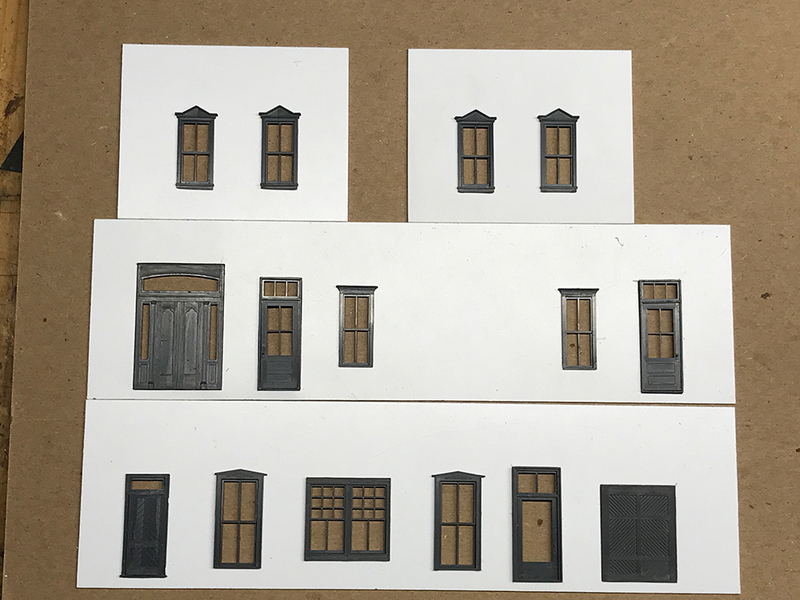 I’ve decided to redo the window and door cuts with the newly purchased items but will continue experimenting with these current walls as I want to try to figure out how to add wall texture such as board and batten.